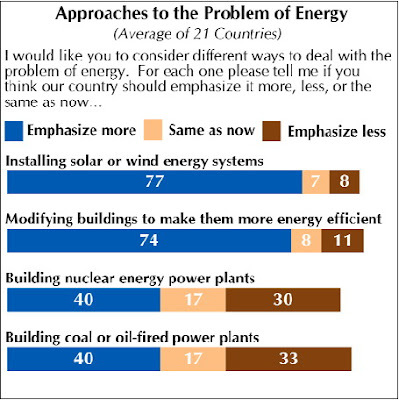 At the same time, Azerbaijanis are not quite prepared to pay a higher price for cleaner energy: while 48% of respondents (69% average of 21 countries) favor requiring utilities to use more alternative energy, even if this would result in higher energy prices, 43% are against it. This could be explained by the fact that energy prices are already quite high and often beyond affordability for the poorest population groups in Azerbaijan. The population is even less prepared to pay more for goods produced with cleaner energy: in Azerbaijan, 55% of respondents would oppose spending more on such efficiently produced products, while 38% would favor it. Among the 21 countries surveyed, this view puts Azerbaijan in a minority with only 4 other countries. Maybe this is not surprising, given that annual inflation already is running high in the country.